I’ve said it before, but I will say it again. Today is my very favorite New Comics Day of the year. The Wednesday before Thanksgiving is an all-around happy day, as most employers let their workers out a little early and pretty much everyone has tomorrow off. Plus, we get to look forward to massive quantities of food. Which can never be a bad thing, right? And, because of such warm and fuzzy feelings, the comic shop is usually crowded, buzzing, and (somewhat) devoid of the usual fanboy whining. Incidentally, that’s the exact thing I’m most thankful for. Being that this is the last Wednesday of the month and comics shops tend to get pretty crowded with customers who have more time than usual to browse and talk, we’re in for a heavy week of new books. Lots of stuff from the majors, and a nice helping of indy titles to round things out. But before we get to that, let’s talk about Thanksgiving. And what I’m actually thankful for—I promise, no snark this time. There are things that I get; that I understand and even expect. And then there are things that just boggle my mind. Like the fact that this blog has been around for over two years now, and you guys still make the effort to stop by each day. Or each week. Or whenever. I don’t think I have the words to express how thankful I am for that. It’s pretty cool, and even though I feel like I’ve been a terrible, boring, repetitive blogger this year, knowing that someone’s reading all of my nonsense (and Nathaniel’s nonsense, too) makes it pretty easy to sit down and type. Even if it is terrible, boring, and repetitive. Especially if it’s repetitive. Did I mention the repetitive? So, yeah. Thanks, everyone, for reading. Now on to the comics. First up, from Marvel, a landmark issue of a landmark book. 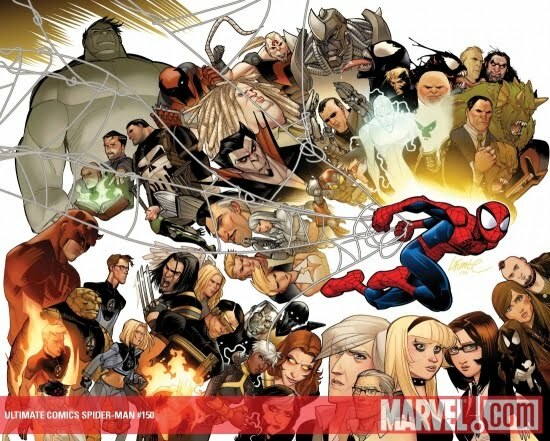 Ultimate Spider-Man reaches its 150th issue today, which is significant for several reasons. First, it’s significant that any book makes it to 150 today (or even 50). This landscape is weird, and fickle, and for a modern title to reach its 150th—with no signs of stopping, I might add—is certainly cause for celebration. Which brings us to the other significant part of 150—the creators. Writer Brian Michael Bendis has been on this book from the start, and that’s staggering. One writer over the course of 150 issues of a mainstream book from Marvel? It’s unheard of—not even Stan Lee can put that on his resume. Not only is this officially the Ultimate Spider-Man 150th issue anniversary, but it is also the 10 year anniversary of the birth of the Ultimate Marvel universe!! Can you believe it?? We can't either! To celebrate, Eisner award-winning series writer Brian Michael Bendis has created this triple size extravaganza and gathered together a stellar lineup of amazing artists!! A reunion of the greatest artists of not only this historic book but of the the entire line of Ultimate Comics. Poor Peter Parker has made such a mess of his life as Spider-Man that the other super heroes are forced to gather together and decide once and for all what to do with the young wall crawler. Guest starring the New Ultimates, the Storm Siblings, Ben Grimm, Iceman, Kitty Pryde and a slew of surprise stars! Also includes reprinting of Ultimate Spider-Man Super Special #1 featuring an all-star artist line-up! 104 pages/54 pages of reprinted material. Well, okay. There's reprinted material aplenty here, but from the solicit at least, it looks like there will be 50 pages of all-new story. So, 50 pages for $6 bucks? In this market? That's not such a bad deal. Next up, we have a bit of a downer in DC/Vertigo's Madame Xanadu, issue 29. Vertigo announced that this series--which has been one of the best books of this new wave of Vertigo titles--will come to an end with this week's issue. 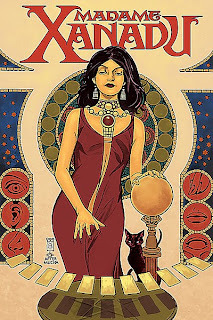 Written by Matt Wagner and with a rotating cast of excellent artists (most prominently Amy Reeder, who drew the first story arc, and Michael Kaluta, who drew the second), Madame Xanadu is a classic case of a critically acclaimed series with relatively low sales (though not Vertigo's lowest-selling book, by any means). There are some whispers that the DC Universe proper has plans for the Madame Xanadu character--as they did with Neil Gaiman's Death character--and so Vertigo can no longer use her. Which is stupid, but it's their policy. And finally today, we have a Batman book that can be read without knowing anything that's gone on for the past 2 years with the character. Scott Snyder, one of my new favorite writers with his excellent work on American Vampire, and artist Jock take over the Dark Knight for a year-long run with a story called, "The Black Mirror." If you've read any DC comics over the past week, then you've surely seen the 5-page preview of this series running through each issue. Obviously, DC has high hopes for this book, and for this new creative team. Up-and-coming writer Scott Snyder (AMERICAN VAMPIRE) and acclaimed artist Jock (THE LOSERS) make their debut as the new ONGOING creative team of DETECTIVE COMICS! In "The Black Mirror" part 1 of 3, a series of brutal murders pushes Batman's detective skills to the limit and forces him to confront one of Gotham City's oldest evils. 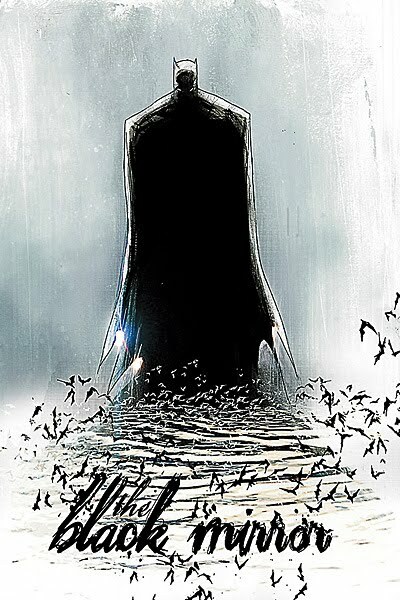 Plus, in the start of a COMMISSIONER GORDON second feature also written by Scott Snyder, when a figure from the past returns to Gotham, Jim Gordon must face some of his darkest demons. Featuring; Art by Francesco Francavilla (GARRISON). So go on. Hit up your LCS this afternoon and get some books for the long holiday weekend ahead. Before you go, though--what are you Waiting for?